Victims of dirty cops and dangerous criminals discuss why they care a lot about this primary. But many haven’t yet decided how they’ll vote on Tuesday. Ask Debra Alexander who she’s voting for in the primary two days from now and her answer circles back to two days earlier – when a city policeman convicted of racketeering was sentenced to 18 years in prison. That officer, Daniel Hersl, “took my mortgage money,” Alexander said, recounting the story to a reporter who approached her today at the weekly Farmer’s Market under the JFX. Alexander said she had given her son nearly $800 to convert to money orders so she could pay the mortgage on her East Baltimore house and take care of other bills. “But [Hersl] took it from my son and dumped him on his head,” said Alexander, who spoke while standing in line in her MTA bus driver’s uniform, waiting for a hot brisket sandwich. The 57-year-old said she gave incumbent state’s attorney Marilyn Mosby credit for charging six officers for the 2015 in-custody death of Freddie Gray, but became disillusioned when the prosecution fizzled and no police officers were convicted. “I don’t know if she didn’t do her homework or her people didn’t do their homework or what exactly is going on, but it makes me think we need somebody new,” she said, adding that she is eying challenger Ivan Bates. Alexander’s vow to keep researching was heard across the city over the weekend, with many describing themselves as undecided or ill-prepared at the 11th hour to cast their vote. Some in Democrat-dominated Baltimore fretted over which challenger had a prayer of beating popular Republican Governor Larry Hogan in the general election in November. “I’m trying to parse it out. 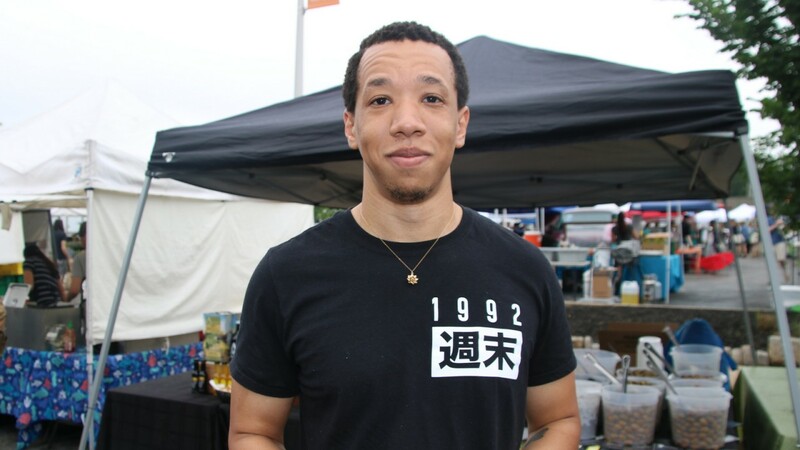 It’s not like I want to compromise, but sometimes small concessions are necessary,” said Jordan Bell-McDonald, of Oakenshawe, pausing to chat about the election at the Waverly Farmer’s market on Saturday. Police corruption (cops caught in the federal Gun Trace Task Force probe stealing from citizens and planting guns and drugs on them), the Freddie Gray case that sparked protests and rioting three years ago, record-breaking levels of violence (judged by its homicide rate, Baltimore was “America’s most dangerous city” last year), and the debate over community policing and criminal justice reform. 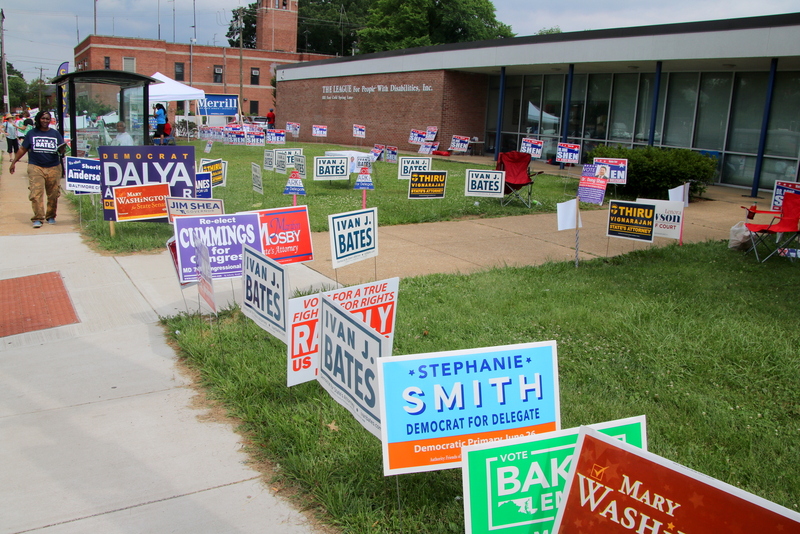 Voters said they were having a tough time parsing and prioritizing these issues and figuring out what any of the Democratic Party candidates for state’s attorney – Mosby, Bates or Thiru Vignarajah – could be expected to do about them. Torn between Mosby’s two challengers, Juanita Fisher was trying to put it all together. “I want to know what kind of programs are you going to put in place for people coming out of prison so they don’t just go back. We’ve got to stop this cycle,” said Fischer, who was shopping at the Waverly Farmer’s Market. 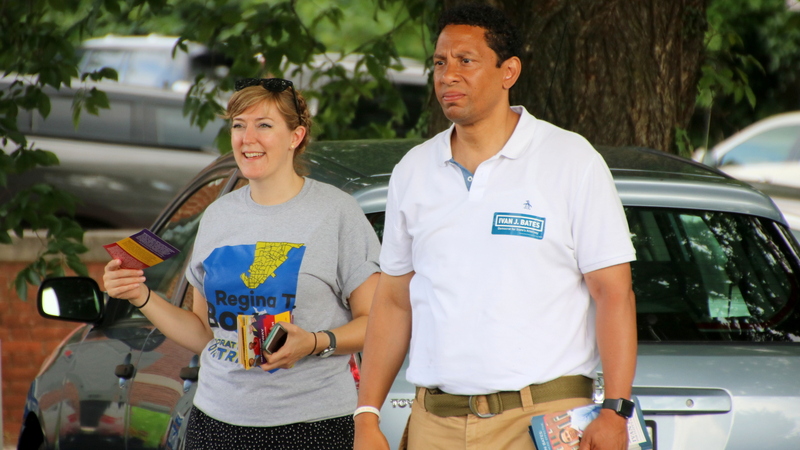 Candidates were out over the weekend trying to get out the vote and help voters like Fisher make up their minds. Former NAACP president Ben Jealous, one of the Democrats running for governor, was at several Baltimore churches today, including his family’s church, St. James Episcopal Church. 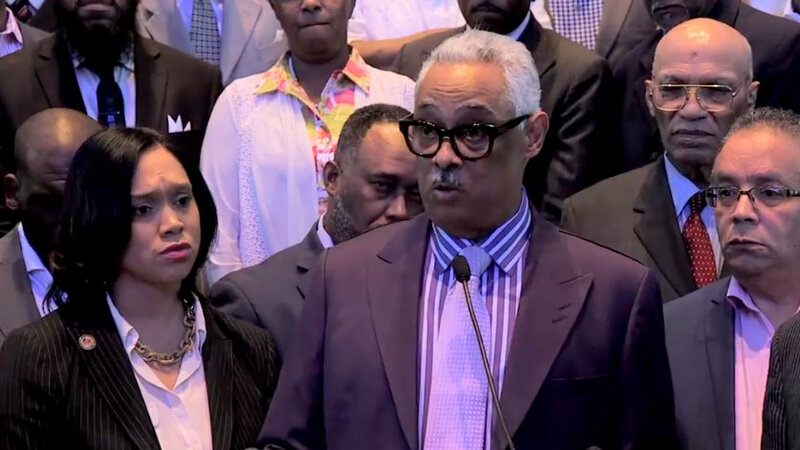 State’s Attorney Marilyn Mosby listens as Bishop Frank Reid III and other ministers endorse her bid for re-election in a video her campaign tweeted today. Marilyn Mosby struck a religious theme as well, tweeting a video today showing her surrounded by faith leaders endorsing her. “Who would dare to stand up to the powers of cultural subjugation!” Bishop Frank Reid III thundered in the short clip. Candidates for state legislative seats were also circulating through the city, working to get the edge in close races. 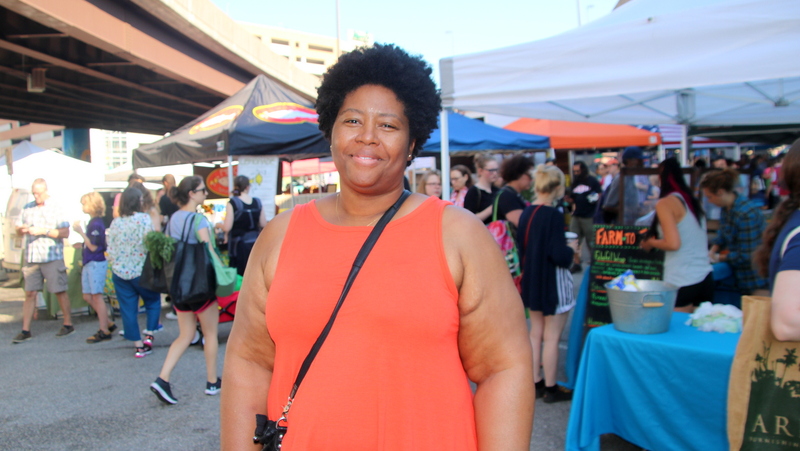 “It’s neck-and-neck right now,” 43rd District Delegate Mary Washington said at the Waverly Farmers Market. The 56-year-old state delegate is trying to unseat Senator Joan Carter Conway, who has represented the Northeast Baltimore district in the Maryland Senate for 21 years. Volunteers for Conway, wearing purple tee shirts were everywhere at the market, handing out literature. Washington and her supporters were out in force, too. “It’s a jump ball, but I jump high and my arms are long,” Washington said. The candidates’ campaigning and the voters’ agonizing come on the eve of a Maryland midterm primary that has already surpassed 2014’s in terms of early voting turnout. After eight days of early voting in Maryland, more than 222,000 people voted, up 57% from the total in 2014, according to the State Board of Elections. A little over 22,000 people voted early in Baltimore, about 6% of eligible voters , according to data released by election officials. Not everyone was focused on criminal justice issues. Shelley Komisar, 63, of Charles Village, was most firm on her intention to vote for Washington and not Conway. Why? “I didn’t like how Conway dragged her feet on [legislation to ban] fracking” in Maryland, said Komisar. 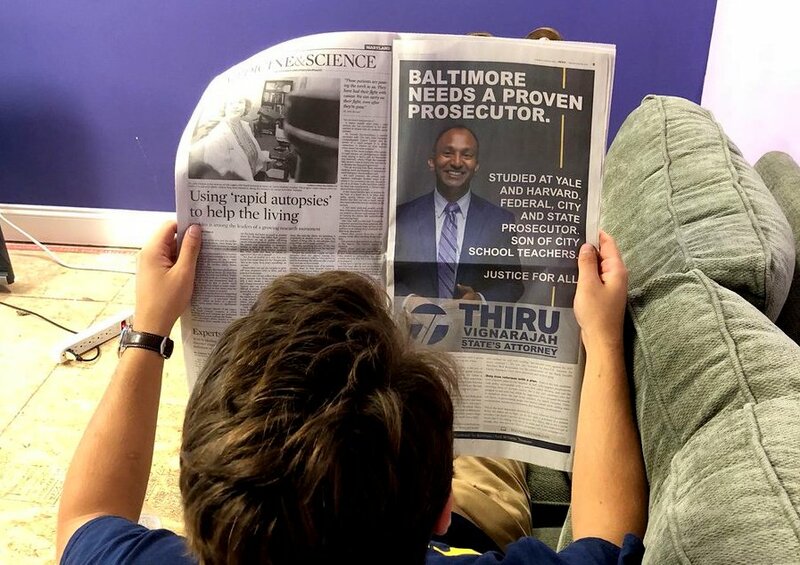 But most found had the race for Baltimore’s top prosecutor at the front of their mind. Virginia Green, of Highlandtown, said she had already cast her vote for Vignarajah. “I met him and heard him talk, and the guy has a brain,” said Green. Wanda Smith said she is strong for Marilyn Mosby. Nicole Richardson, meanwhile, said was leaning towards Bates and what motivated her is dissatisfaction with the level of crime. It’s a subject that touches the Bolton Hill resident personally. Like so many others who spoke this weekend, Richardson, who works as an underwriter, struggled with the other issues. “Are we doing enough to prevent crime, to hold the police accountable? That’s part of it, too, I know,” she said.